Please check the lock. 錠がかかっているか調べてください. a lock of cars at the intersection 交差点での車の渋帯. We have a lock on the suspect's movements. 我々は容疑者の動きを封じている. They have a lock on laptop sales. 彼らはラップトップ(コンピューター)の販売を独占している. 不可算名詞 [具体的には 可算名詞] 【自動車】 (ハンドルを端から端まで回した時の)最大回転数. lock a door [suitcase] ドア[スーツケース]にかぎをかける. He locked up the shop and went home. 彼は店を閉じて帰宅した. He locked up [away] the papers and left. 彼はちゃんとその書類をかぎのかかる所にしまってから出かけた. He locked up [away] the documents in the safe. 彼は書類を金庫にしまい込んだ. They locked him up overnight. 彼らは彼を一晩監禁した. The guards locked the prisoners up in their cells. 看守たちは囚人を独房に入れた. 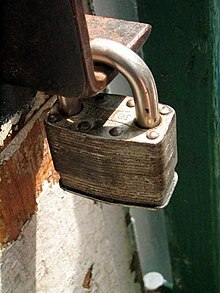 〔+目的語(+up)+前置詞+(代)名詞〕[lock oneself で] 〔…に〕閉じこもる 〔in，into〕. He usually locks himself in his study. 彼はたいてい一人で書斎に閉じこもっている. The ship was locked in ice. 船は氷に閉ざされて動けなくなった. Traffic was locked up at the intersection. 交差点で交通が渋帯していた. lock one's fingers together 指をしっかりと組む. She locked her arms about his neck. 彼女は両腕をぎゅっと彼の首に回した. He had all his capital locked up in the business. 彼はその事業に全資本を投資していた. We have the election locked up. 選挙はほぼこっちのものだ. The door locks automatically. そのドアは自動的にかぎがかかる. This suitcase won't lock. このスーツケースはどうもかぎがかからない. Don't forget to lock the door when you go out. The policeman locked his arms around the thief's neck. The ship is locked in ice. Most hotels have doors that lock automatically. The wheels have locked completely. She locked up her jewels in the box. Please open the lock with this key. He left the key in the lock. The papers are kept under lock and key. ・My PC locks on occasion and requires a cold boot. わたしのパソコンは時々ハングアップを起こし, コールドブートしなければならなくなる. To prevent users from joining a conference, whether or not they have an invitation. To allow the shared user profile configuration set by the administrator to remain static from one user session to another. To block other meeting participants from controlling the Office Live Meeting 2007 client during a presentation. A software security feature that requires a key or dongle in order for the application to run correctly. A restriction on access to a resource in a multiuser environment. Ensure that two processes do not affect the same file or project in a database at the same time. From Middle English lok, from 古期英語 loc, from Proto-Germanic *luką. The verb is from Middle English locken, lokken, louken, from 古期英語 lūcan, from Proto-Germanic *lūkaną. Doublet of luxe. (computing, by extension) A mutex or other token restricting access to a resource. […] the application must first acquire a lock on a file or a portion of a file before reading data and modifying it. Here the canal came to a check, ending abruptly with a large lock. "I never saw such a gun in my life," replied poor Winkle, looking at the lock, as if that would do any good. Complete control over a situation. Even though he had not yet done so, Jack felt he had a lock on the game. Something sure to be a success. Brian thinks she's a lock to get a scholarship somewhere. Ashton only had to wait three minutes for his second try, lock Louis Deacon setting it up with a rollocking line-break, before Romania got on the scoreboard courtesy of a penalty from fly-half Marin Danut Dumbrava. A fastening together or interlacing; a closing of one thing upon another; a state of being fixed or immovable. A place from which egress is prevented, as by a lock. A device for keeping a wheel from turning. (intransitive) To become fastened in place. (intransitive) To be capable of becoming fastened in place. This door locks with a key. (transitive) To intertwine or dovetail. We locked arms and stepped out into the night. (intransitive, break dancing) To freeze one's body or a part thereof in place. To furnish (a canal) with locks. 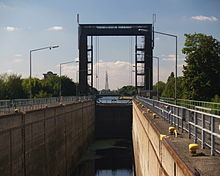 To raise or lower (a boat) in a lock. To seize (e.g. the sword arm of an antagonist) by turning the left arm around it, to disarm him. (Internet, transitive) To officially prevent other users from posting in (a thread). From Middle English lok, lokke, from 古期英語 locc, from Proto-Germanic *lukkaz, from Proto-Indo-European *lugnó-, from Proto-Indo-European *lewg- (“to bend”). Cognate with Old Norse lokkr (whence Danish lok), German Locke. It has been theorised that the word may be related to the Gothic verb *𐌻𐌿𐌺𐌰𐌽 (*lukan, “to shut”) in its ancient meaning to curb. A tuft or length of hair, wool etc. If I consent to burn them, will you promise faithfully neither to send nor receive a letter again, nor a book (for I perceive you have sent him books), nor locks of hair, nor rings, nor playthings? From Middle English -lok, -lak, -lac, from 古期英語 -lāc (suffix denoting activity または action), from Proto-Germanic *laiką (“play, sport, fight, activity”), *laikaz (“game, dance, hymn, sport”), from Proto-Indo-European *leyg- (“to bounce, shake, tremble”). The etymology of the suffix is the same as that of the noun lāc "play, sport", also "sacrifice, offering", corresponding to obsolete Modern English lake (dialectal laik) "sport, fun, glee, game", cognate to Gothic laiks "dance", Old Norse leikr "game, sport" and Old High German leih "play, song, melody" (> Old French lai "song, lyric, poem, lay"), obsolete or dialectal German Leich. 古期英語 līcian ("to please", Modern English like) is from the same root. In modern English, the noun has been reintroduced through the cognate Swedish lek as a specialist term referring to mating behaviour.